Chevrolet has been trying to make things simpler and easier for the production of their vehicles and therefore Chevrolet designers are now using 3D printing rapid prototyping options to make changes to the exteriors and interiors of the all new 2014 Chevrolet Malibu. Chevrolet designers claim that this is an interesting technology that allows them to grow prototype parts made from powder or liquid resin at a cost which is minimum rather than building the parts and testing them out. 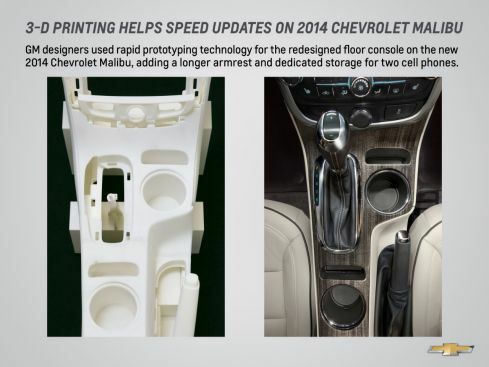 Chevrolet’s 3D printing technology makes use of the laser sintering and stereo lithography that allows them to make samples of the Malibu parts. Chevrolet said that they have always worked on better technologies that can allow them to handle things in a better way. The car maker said that the process makes use of specialized software that uses math data and digital lasers and sculpts the prototype parts in just few hours rather than taking weeks that happens when designers make use of clay sculpting. The overall cost of clay sculpting is also much higher and therefore it adds to the cost of production. Todd Pawlik Chief Engineer at Chevrolet said that nothing beats rapid prototyping when the company needs fully functional prototype parts. The American automaker said that currently they are working on 2014 Chevrolet Malibu floor console and smartphone holders for driver and passengers. The company said that they want to make sure that they are focusing on the right kind of design that syncs with the exterior of the vehicle. They are also updating and upgrading the design of the center stack. Chevrolet said that they will also work on the front fascia of the new Malibu to make it aerodynamically better. Rapid prototyping will also be used to re-sculpt the front seat back panels to improve the passenger comfort.